Pavement Interactive > Pavement Articles > Pavement Design – What’s My Structural Number? In designing and building pavements, we sometimes casually assume that making a pavement thicker also makes it stronger, but even to the extent this is true, how thick is thick enough? One of the key questions in the structural design of an asphalt pavement is how thick each layer of the structure should be. During design, these thicknesses are related to the Structural Number (SN), which is an abstract value that expresses the structural strength of the overall pavement. In this edition of the RoadReady newsletter, we’ll look at the concept of a Structural Number and the role it plays in design equations. Formal pavement design relies on engineering calculations based on established design equations, such as the empirical equations found in the 1993 AASHTO Guide for Design of Pavement Structures. A critical element of the flexible pavement equation is the Structural Number, which represents the overall structural requirement needed to sustain the traffic loads anticipated in the design. The required Structural Number depends on a combination of existing soil support, total traffic loads, pavement serviceability, and environmental conditions. AASHTO design equation for flexible pavements. The Structural Number is indicated as SN. Although design equations can be used in different ways depending on the inputs available, one of their most common applications is effectively to solve for the Structural Number. Once the value of the Structural Number is defined, this can then be used to determine appropriate thicknesses for each of the pavement layers. Formula indicating the relationship of the structural number to pavement layer characteristics. The layer and drainage coefficients are values that should reflect characteristics of the material used to construct that pavement layer. The thicknesses of the individual layers are effectively what you are using the design equation, and the Structural Number, to figure out. Since the layer coefficient can be affected by material properties as well as the position of the layer in which the material will be used, in some cases different values might be appropriate for local conditions. A drainage coefficient is a value assigned to a pavement layer that represents its relative loss of strength due to drainage characteristics and exposure to moisture saturation. Layers that drain slowly or are often saturated would have a lower drainage coefficient, while layers that drain quickly and almost never become saturated would have a higher drainage coefficient. For most pavement designs, it is probably simplest and best to set the drainage coefficient equal to 1, which indicates normal drainage characteristics. A permeable base layer placed with a geotextile barrier to improve drainage. Another point to keep in mind is that because the Structural Number is being used to solve for layer thickness, changing a drainage coefficient will only have an impact on the thickness of the pavement layers. It will not make any layer more dense or otherwise address a fundamental drainage problem that would significantly impact the service life of the pavement. If there is an actual drainage problem with one of the layers, it is better to tackle that directly by designing a drainage system, or by increasing layer density to minimize water infiltration. Once you have plugged in appropriate layer and drainage coefficients, you can then work out suitable thicknesses for each of the pavement layers. 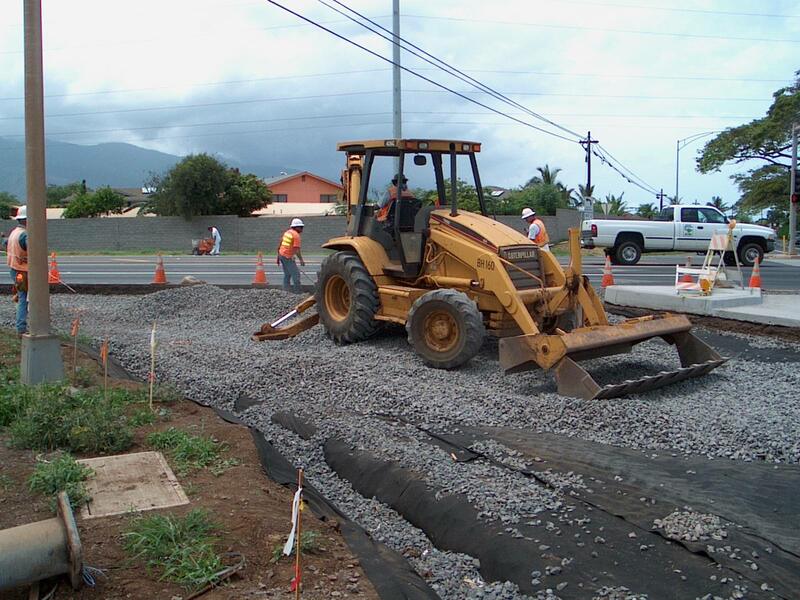 The AASHTO method can also be applied to evaluating existing pavements as well as the design of new pavement structures. For example, when considering a pavement in need of rehabilitation, the existing layer thicknesses could be plugged in to determine a Structural Number for the pavement in place; comparing this with the Structural Number required for the updated design would give an indication of the type and thickness of rehabilitation treatment needed. It is worth noting that even when you have determined the Structural Number, this does not automatically dictate a single correct answer for pavement layer thickness. Assuming there is more than one structural layer, there will normally be different combinations of layer thickness that could achieve the required Structural Number. However, based on the relative costs of materials for different layers, along with practical construction considerations (such as not making any one layer excessively thick or thin), it is likely that defining the Structural Number will steer you to a particular combination of layer thicknesses. The concept of a Structural Number may seem a little mysterious at first. For example, as an abstract value, it doesn’t express strength in terms of a particular unit of measurement we could easily recognize. In this issue of the RoadReady newsletter, we wanted to help you understand a little bit of the theory behind the Structural Number to have an appreciation of what it indicates. In a sense, the Structural Number is taking some critical design information – such as material properties, traffic loads, and pavement performance criteria – that exists in very different forms and boiling them down into a single number. Doing this is what makes empirical asphalt pavement design possible, so the Structural Number is a key to the entire process of designing a quality pavement. Thans for this nice review of the thickness design. Still a point to be tackeld thst is Mr, the subgrade risiliant modulus, a factor needs a complicated tedt to obtain. Who accurate is the use of 1500xCBR value. This article is very interesting and useful.Ihave one doubt that what are the different tests conducted to determine the rutting performance of pavements?Another one is difference between wheel rut tester and wheel tracker even though both are used for rut depth measurement. If CBR less than 10 then 1500*CBR. I think minum CBR is 5 without Geo Grid and textiles. This article is very interesting. I would like to add that the resilient modulus correlation with the CBR (1500 x CBR) of the subgrade, has a great reliability if the CBR is less than 20%. There has been an update of the correlation equation, 2555 x (CBR^0.64). However, the resilient modulus should be analyse. The resilient modulus is a variable that depends on the deviator stress that acts on the layer. I have been working with resilient modulus for a while, and I recommend to analyse the resilient modulus by the triaxial test for a best reliability in the design. Do we have requirement of minimum SN?If yes, what should be the minimum structure no?